Some five weeks after Lincoln delivered his Second Inaugural Address, he was shot on the evening of April 14, 1865, and died the following morning. 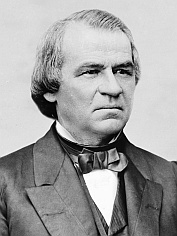 In attempting to pursue Lincoln's promise to "bind up the nation's wounds," Vice President Andrew Johnson faced significant legal and political barriers. Johnson's ascension to the presidency was the first time that the succession process had come into effect, and some questioned whether the Constitution gave Johnson the right to exercise the full powers of the position or gave him only one vote within the Lincoln cabinet, which would govern as a collective body until the next election. In 1864, despite being a Democrat, Johnson was chosen by Lincoln as his vice presidential candidate, primarily for political reasons to broaden his ticket's appeal to Democrats and others in the cause of "national unity," the new name adopted by the Republican Party to emphasize its attempt to appeal to a wider coalition of supporters. Lincoln understood that his election to his first term in 1860 was largely due to the split in the Democratic Party and the division of votes between its respective factions, and that the Republican base of abolitionists was unlikely to be sufficient to overcome the Democrats if they united behind a single candidate. 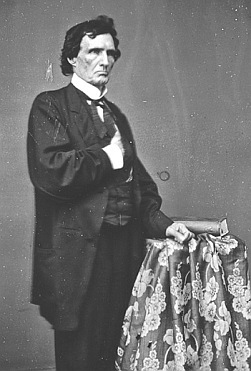 After the election, however, the Radical Republicans led by Congressman Thaddeus Stevens of Pennsylvania, which had reluctantly gone along with Johnson's joining the ticket in order to help secure Lincoln's re-election, renewed their calls for harsh terms before the states of the defeated Confederacy could regain their rights in the Union. In the wake of Lincoln's assassination, their position gained further strength as they sought to punish the South. Johnson had had few direct contacts with Lincoln. His post-election role was also somewhat curious, given that he was elected in November, but would not formally be sworn as vice president until the following March, joining an incumbent administration which had just won a brutal War without his participation. Reportedly, his apparent inebriation at the Inaugural Ball while delivering a speech, possibly caused by an alcoholic medicine he was taking for a severe cold and fever, embarrassed Lincoln and others in attendance and he was not invited to meetings of the President with his cabinet in the few weeks between his inauguration as vice president and Lincoln's assassination. Lincoln himself had clashed with the Radical Republicans when in 1863 he issued a plan for reconstruction which included a general amnesty given to all who would take an oath of loyalty to the United States and pledge to obey all federal laws pertaining to slavery; a temporary exclusion of Confederate officials and military leaders from the process; and allow Southern states to establish new governments and elect representatives to Congress when one-tenth of the number of the state's voters who had participated in the 1860 election had taken the loyalty oath. In his last public speech on April 11, 1865, two days before his assassination, Lincoln also extensively defended his views on reconstruction, particularly the criticism he had received for his willingness to accept the re-entry of Louisiana into the Union when 12,000 of its citizens had agreed to a loyalty oath but without its legislature enacting any guarantee of voting rights for freed slaves. While Congress was out of session in 1865, Johnson began to implement his own reconstruction program largely modeled on that suggested by Lincoln in 1863. 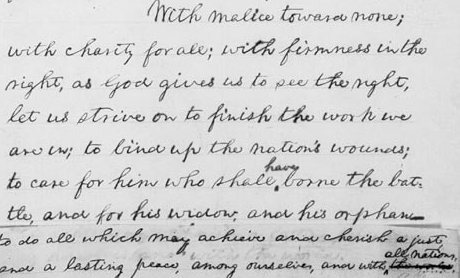 Johnson's plan included granting blanket pardons to those in the former Confederacy who would take an oath of allegiance; a temporary exclusion of pardons to political leaders and men with wealth over $20,000, who would be required to apply for individual consideration for special presidential pardons; and allowing Southern states that had abolished slavery and repealed their articles of secession to re-assume their powers of government and elect representatives to the Congress. None of the new state constitutions approved on the basis of Johnson's conditions allowed blacks to vote, and Johnson himself opposed the idea. "It would breed a war of races," he wrote in a letter to Southern governors and legislatures, assuring them that the Thirteenth Amendment abolishing slavery, which had been submitted to the states for ratification after Congressional approval in February 1865, would not be interpreted to mandate black suffrage. Southern legislatures also enacted a series of so-called "black codes" imposing restrictions upon freed Negroes that regulated civil and legal rights from marriage to the right to hold and sell property, also effectively forcing many to work as laborers at menial wages for their former slavemasters. The Radical Republicans denounced Johnson's moderate program, and set out to adopt their own much more punitive program for dealing with the post-WAR South. They gained popular support from those angered at seeing many Confederate leaders returning to positions of influence and the re-institution of many of the economic and social practices of slavery under the guise of the "black codes" by the Southern state governments. By the time Congress re-convened in December 1865, most southern state governments were reconstructed, and had elected representatives to Congress. The Radicals' first step was to refuse to seat any senator or representative elected from the old Confederacy. They next passed measures dealing with the former slaves, particularly passage of the Freedman's Bureau Bill in February 1866 authorizing the federal government to provide food, clothing and land to former slaves and empowering military courts to try violations of their civil rights. When President Johnson vetoed the bill on the ground that it violated the 5th amendment, Congress overrode the veto in July 1866. Congress also enacted over Johnson's veto the Civil Rights Act of 1866 giving citizenship to freedmen and other legislation placing limits on state segregation laws. A few months later Congress submitted to the states the Fourteenth Amendment, which specified that no state should "deprive any person of life, liberty, or property, without due process of law." All the former Confederate States except Tennessee refused to ratify the amendment. Two bloody race riots in Memphis and New Orleans also inflamed feelings; the New Orleans riot was provoked by a mob including many policemen that invaded a Republican-dominated interracial state constitutional convention convened to ratify a constitution providing voting rights for blacks. Despite vigorous campaigning by President Johnson against "radical" Republicans, the November 1966 election was an overwhelming victory for Johnson's opponents, giving them veto-proof majorities the Congress. In March 1867, the Radicals enacted their own plan of reconstruction, ignoring the Southern state governments and again placing southern states under military rule. They also passed laws placing restrictions upon the President, including the Tenure in Office Act. Johnson deliberately violated the Act by dismissing Secretary of War Edwin M. Stanton without Senate approval and Stanton refused to comply with the President's order, barricading himself in his office. The conflict between Stanton and Johnson had been provoked over Stanton's intention to use the Federal troops under his control occupying the Southern states to enforce the voting rights of blacks. 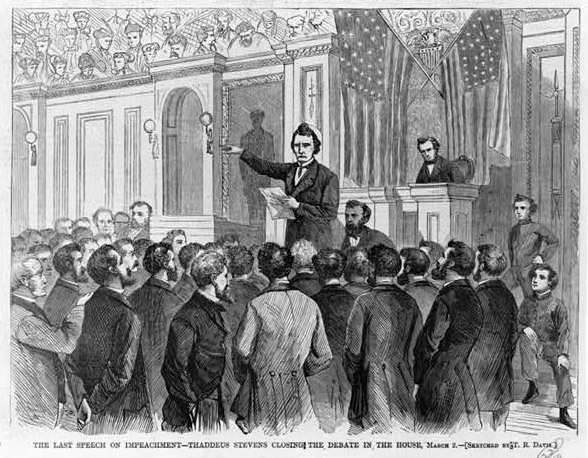 On February 24, 1868, the House, by a strict party-line vote of 126 to 47, adopted eleven articles of impeachment against Johnson. The President's trial by the Senate opened in March with the Chief Justice of the United States, Salmon P. Chase, presiding. Issues in dispute during the trial included whether the Tenure in Office Act applied to Stanton; whether, if it did apply, the Act was constitutional; and whether Johnson committed an impeachable offense in attacking Congress for its policies on Reconstruction. The vote on each of the first three articles of impeachment was 35 to 19, one vote short of the two thirds majority needed for conviction. On May 26, the Senate voted to adjourn the trial without considering the remaining articles. The Senate's failure to convict Johnson was attributed both to concerns of key Republican Senators based on principle over the merits of the case against Johnson, as well as their dislike of the contentious Senate President Pro Tempore Benjamin Wade, who would have become President until the next national election in November in the event of Johnson’s suspension, resignation or removal from office. After Johnson's acquittal, Stanton ended his defiance of Johnson and left his office. 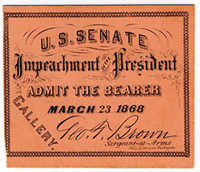 Johnson continued to complete the remainder of Lincoln's term, but was denied re-nomination in 1868, when the Republicans turned to Ulysses S. Grant as their nominee. Johnson returned to Tennessee and in 1875 was elected to the U.S. Senate, but later that same year suffered a stroke and soon died.